The UComfy Shiatsu Heated Foot Massager provides a blissful foot massage, helping you relax and relieving the stress placed on your feet. It provides the same benefits of pain relief as regular visits to a spa yet it requires only a one-time purchase at a reasonable price. Two types of massage action are available with the UComfy massager: shiatsu and vibration/pressure. Together, they are able to manipulate a number of pressure points on your feet and also provide a reflexology massage. The massage helps improve circulation in your feet, ease away pain, and loosen strained muscles and tendons. This results in energized foot and leg muscles, freeing you from the problem of continual foot pain. Shiatsu massage is a technique that began in ancient Japan. The meaning of “shiatsu” in the Japanese language is “finger pressure.” Over time, this technique became part of typical Chinese medical practice. Shiatsu massage follows the principles of the meridian healing system, a system associated with the proper functioning of twelve important organs in the body. The shiatsu technique utilizes finger, thumb, and palm pressure, together with assisted stretching and manipulation of joints, to increase blood circulation and open your body. Meridian system principles indicate that this type of massage allows increased energy to flow throughout your body. According to the system, if pain exists then there must be an imbalance in the body. Such an imbalanced body causes the immune system to weaken and become vulnerable to disease. Thus, when someone loses energy, their body weakens and organs do not function well. A result is that your body’s chi cannot flow properly throughout your system. Shiatsu massage helps boost the immune system. The Shiatsu massage is accomplished through sets of rollers that “knead” your feet. You simply slide your feet into the foot pockets and relax. Unlike many other foot massagers, this unit massages both the top and the bottom of your feet, as well as the sides. 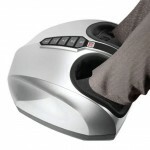 A kneading button on the top of the massager allows you to turn the shiatsu massage off or on. 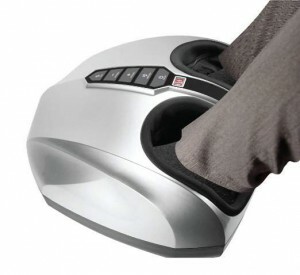 A unique feature of this shiatsu foot massager is that the kneading changes direction every couple minutes. This provides a more thorough massage, providing opportunity for the kneading feature to hit more pressure points and sore spots on your feet. Our feet are often abused on a daily basis from too much standing, poor-fitting shoes, or extra activity. A key benefit of using a foot massager is that the massage can help increase circulation in your feet. 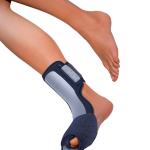 This helps to relax tired foot muscles and relieve the aches that accumulate in your feet due to standing too much. Though the description of the UComfy foot massager talks about “vibration” as one of the two types of massage techniques available, in truth the massager does not actually vibrate. Air pressure is used in place of actual vibration. Five levels of pressure are available. You control the level through the use of the + (increase) and – (decrease) vibration/pressure buttons. Note that as you run this unit there is a level of noise created by the air pressure changing. The sound being emitted is similar to the sound made by an automated blood pressure cuff, not loud but distinctive. Heat is an added benefit on the UComfy massager. So, what does heat do for you? First of all, if your feet tend to be cold, you can warm your feet while receiving a very comfortable massage. A little heat also helps to further relax the muscles in your feet. The great thing is, you have complete control over when the heat is on or off. Simply press the heat button. You get shiatsu massage, vibration massage, and warmth for your feet, all in one small unit! This massager weighs just over 12 pounds. It measures in at 16¾ inches by 16¼ inches at a height of 12½ inches. At that weight and size it is easy to pick up and move around. You can use it while watching television or have it under a desk while you are working. It’s up to you. Simply plug it into a 110 volt socket, situate your feet in the massager, and turn it on by pressing the On/Off button. When you turn on the massager, the timer will automatically be set to 15 minutes. The timer will count down the minutes and shut off once you have completed your massage. The UComfy massager was rated as the #2 electric foot massager machine in 2015 by Ezvid. On Amazon, out of 189 reviews, 57% gave this massager 5 out of 5 stars and another 17% gave it 4 stars. This means that almost three-quarters of those who wrote reviews were highly satisfied with the product. Multiple massage techniques built into one unit. Works only with 110 volts. This is not really a big deal since you can buy converters elsewhere. If your feet are not situated correctly within the foot channels you may feel discomfort. Also, you should be aware that the highest levels of pressure may be too intense and may cause pain. For this reason, new users are encouraged to start at the lowest level of pressure and increase the pressure as you become comfortable with the massage. If you suffer from foot-related pain then this massage unit could be just right for you. My feet and calves are often quite strained and sore by the end of the day, especially if I’ve been standing a lot or wearing hard-soled shoes. A soothing foot massage helps reduce or even eliminate that daily pain, allowing me to sleep better and feel more refreshed in the morning. How about you? Have you used an electric foot massager at any point? Was it helpful or did it end up stuck away in a closet? Did it have the features of the UComfy Shiatsu Foot Massager with Heat? I would love to hear from you – your experience or just the issues you are having with your feet. Add your thoughts using the comment area below. Man I didn’t even know that there were ways to get rid of heel pain. I like the idea of a heated massager helping me out with this. What a luxurious method. I actually have developed some of this type of pain and originally thought I was growing again as an adult! Hah I wish. This is not the case but more likely because I stand on concrete all day long with my job. 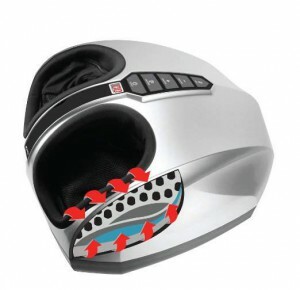 I appreciate this article on the Shiatsu Heated foot massager. It should help me a lot. Yes, there are numerous ways to work on heel pain. You just need to try a few of them to see what works best for you. 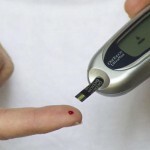 The intent of this site is to present these ideas along with products that can also help. The massager is a great way to relax your feet at the end of the day. It could be a wonderful New Years gift to yourself. By the way, if you are standing on concrete all day then you should start by considering your footwear. That is, if you have the flexibility to wear something with softer soles. I haven’t specifically addressed footwear yet but you can see the various treatments I have discussed via this treatments page. You might also find my post about what typical shoes are doing to your feet helpful. Great product and a great review. Initially I thought this was one of those Spa’s where you put water and then it works it’s magic. I’s love it, great foot massager and ful on shiatsu but the heated part is a big no (I live in Thailand) if it was possible with ice cool air yay! defo! Hi Derek. Thanks for your note. You gave me a good laugh. I can certainly understand the lack of desire for the heat! The good thing with this one is that the heat is optional – you can keep it off and just enjoy the other benefits. This particular model of massager does not use any water. If you like the cold treatment and want to give your foot a bit of a massage with it then you might consider using a plastic water bottle frozen in your refrigerator. Just roll the frozen bottle under your feet to get a combination of massage and icing. This is a great website, very informative and so not boring. I say the because usually when I read a site, I will at least read the first page, but if it is not interesting enough to me, then I will just quit. But this website was different. Even though I, nor anyone I know suffer from this kind of pain, I still wanted to know about it, so I read on and on. My only question is, about the 17 causes of this problem. Why do you refer us to a different site for this information instead of having it on your own site? I mean it’s all about learning and supplying your visitors with the facts right? But anyway, I think this is a job well done! I really appreciate your input, Retha. You ask a very good question. I originally referred to the Mayo Clinic website because it is an authoritative site developed by a leading medical institute so I didn’t feel I needed to repeat their information. That page was one of the first pages I developed for this site. Your question makes me think, however, that it might now be time to add the list from Mayo Clinic onto that page. I’m glad you found the site interesting and helpful. Now you know a little bit about plantar fasciitis and heel pain so, if you are like me and never encounter it until a bit later in life, you’ll already have some knowledge of the issues involved. If the UComfy Shiatsu Heated Foot Massager genuinely works as well as you say it does, then this is a product I’d definitely consider investing in. The price is actually really impressive, but that’s coming from someone who spends 1/5 of that money on spa treatments constantly. This was a really good review that covered nearly everything I could need to know, and it was really useful and informative. Thank you. Well thank you, Tempest. I appreciate your comments. Obviously, as with any product of this type, each individual will have to decide whether they like the “fit and feel”. But, as I combed a large number of reviews and user feedback, I found many very positive responses and only a few less-than-completely positive ones. And in that latter category, many of the issues noted were minor. The product works great and it sure feels good on the feet! I really need this massager . Looks gooooddd, relaxing,and I think it will really help. You are very welcome, Cristina. This massager is one of the best around. It has consistently been rated in the top 2 or 3 in its class. It’s not perfect, of course, but certainly can help relieve the pain you are feeling every day. In the meantime, you might also want to read up on a few of the stretches and massage techniques that can help your tired legs and feet. Take a look at Eliminate Foot Pain with Exercises for Toes and also Deep Tissue Massage and Plantar Fasciitis. I hope these can also help relieve some of the pain. Hi, I would like to order UComfy Shiatsu Heated Foot Massager for one of my clients in Dublin, Ireland. Please let me know the contact details to purchase the same. Hello Elayaraja. The quickest way to order is to click on the Product name link at the very beginning of this article. It will bring you directly into the Amazon site and you can order from there. I do not know for sure if you can have it shipped directly to Dublin or if you will have to order it for yourself and ship it. This massager looks like it is perfect for me. I don’t have heal pain but I do have numbness in my feet. It’s in the balls of my feet and my toes. I’m hoping that it will relieve the pain in my feet and give me comfort too. I see that it is heated too. My main concern is the numbness. Will this foot massager relieve my numbness? Hi Rob. Certainly the massaging of your feet will help stimulate the nerve endings which, under normal circumstances, should relieve at least some of the numbness. I hesitate to strictly say “yes” to your question because there are many things that can cause numbness. One of the simplest issues is bad footwear! If you stand a lot on your job or wear shoes that pinch your toes, that could be causing the numbness. On the other hand, the HealthLine website shares a list of 16 medical conditions that can contribute to foot numbness. Generally, I’d say that this massager had enough settings and features that it should help, at least to some degree. Hi Allyn, thanks for a great and thorough article. I’ve had trouble with my feet for many years. I also have been diagnosed with peripheral neuropathy which is nerve damage. I don’t have a lot of feeling on the bottom of my feet. Do you think this might help increase circulation thereby increasing some of the feeling I’ve lost? I am very interested to learn your response. Thanks for sharing. Hi Robert. It sounds like you have a rather severe case of neuropathy, something I haven’t studied all that much. What I will point you to is an excellent article that talks about potential benefits of using a massager when one has nerve damage issues. The article is called, “Best Foot Massager for Peripheral Neuropathy“. Again, I’m not a doctor, so I can only go by what I’ve researched previously and read on this topic. The fact that you have only limited feeling in your foot could limit the helpfulness of massagers, however, stimulating the nerves certainly seems like something that would be helpful, no matter what. 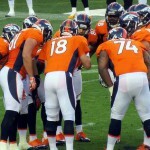 Read the article and perhaps ask a foot specialist if they agree. Hope this helps!